My young veiled Cham turns dark and bolts immediately when I open his setup sometimes even when I get close to the cage I don't chase or grab him I just let him do his thing obviously he's scared but I can't hand feed him I can't even get the cricket or my hand close to him to even see it. Is this normal? Will he calm down? Is there anything I can do or am I doing something wrong? Hi there. Welcome to the forum. This is very normal. They typically are shy and do not like being disturbed. It can take weeks or even months to build up trust using feeders and moving very slowly around them. Some will warm up and tolerate their human keepers and some may always be grumpy and just want to be left alone. 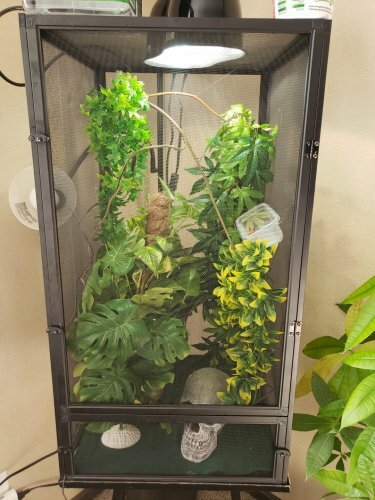 I do see some issues with the enclosure and lighting. We would be happy to make sure you were given all the right info when you got the baby. If you want to fill out this form with as much detail as possible and include more pics. If you just got the cham then this is normal. You'll need to build a trust between you and the cham. Best thing to do at this time is ignore the chameleon when you are in the cage. Spend time in the room with the enclosure doing calm activities where you are not making a lot of sudden movements. After a few weeks the chameleon will get used to you being there and will react less to you. There are a ton of thread on trust building so I am not going to type it all out now. Just remember to not rush anything. This takes a lot of time. Also, as mentioned above, fill out the form posted. I would remove the green pad in the bottom since it will get moldy and dirty very quick with the multiple mistings each day. Also, you'll need to upgrade your UVB lighting to a T5HO or T8 linear fixture since the coil compact UVB bulbs do not benefit the chameleon at all in the long term. The compact bulbs will focus the UVB in a small area which the cham would need to spend a lot of time under to get the necessary UVB exposure.